On June 5, the May Class and Component prices were announced. 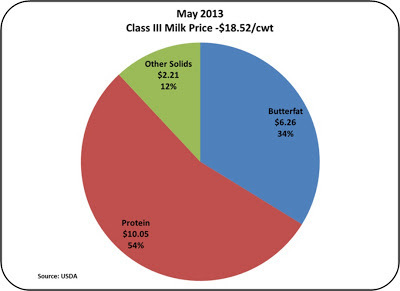 The Class III milk price was $18.52/cwt, the highest price for 2013. The higher May milk price was driven by escalating cheese prices. 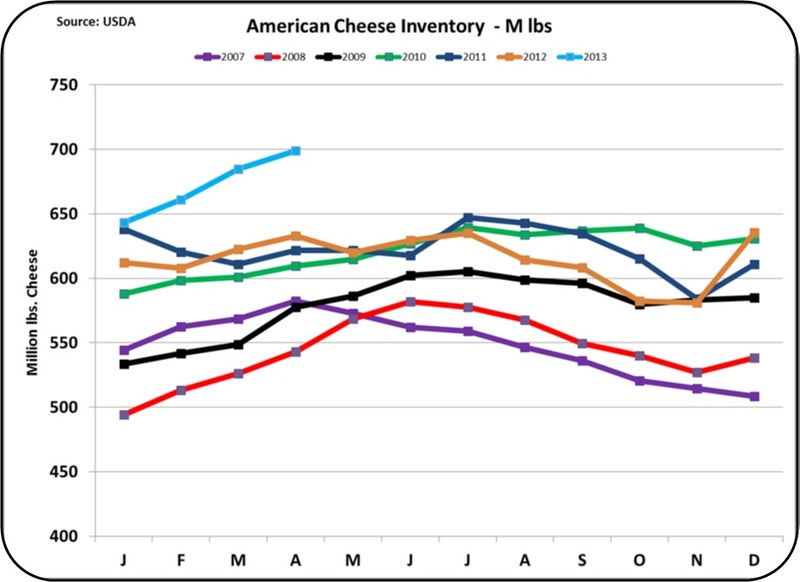 (See the April 23, 2009 post for an explanation of how cheese prices drive milk prices.) 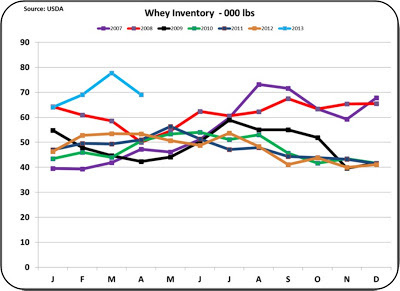 Inventories of cheese, butter, and whey are all high which creates concern about downward pricing pressure. Continued high inventories will force price declines if the inventories are not reduced. May's component prices fall in line with the long term trends. Protein at $3.36/lb shows the importance of protein for the economical production of the growing cheese and yogurt sectors. 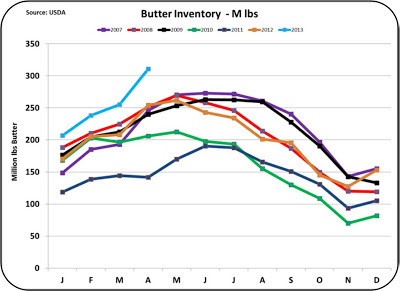 Butterfat declined slightly and may continue its retreat consistent with consumer consumption changes. 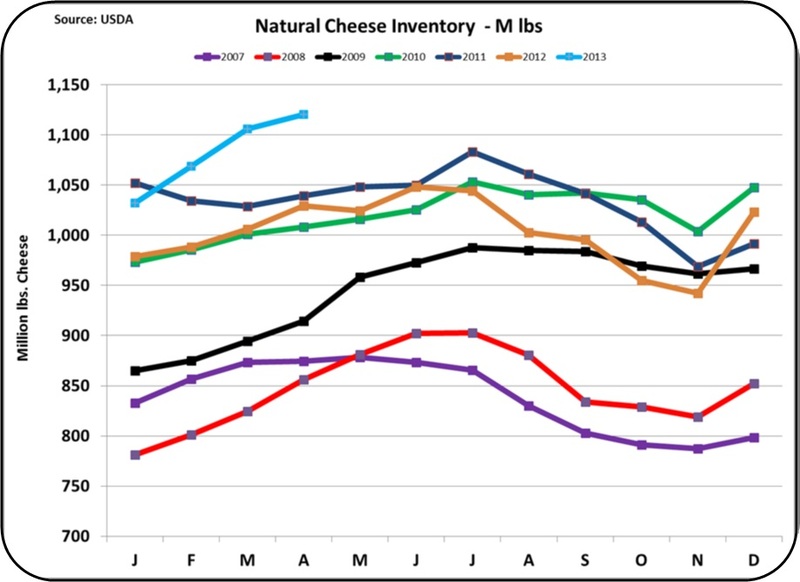 Other Solids were up after a few months of declines, solidifying its increased importance in contributing to the milk check. 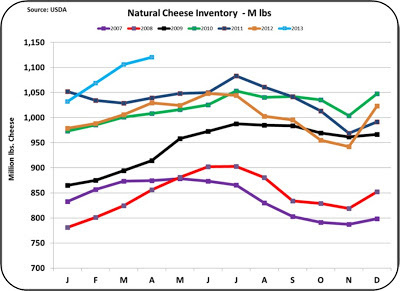 The production of whey is dependent on cheese production; and therefore, demand can outstrip production. No one manufactures whey by itself. 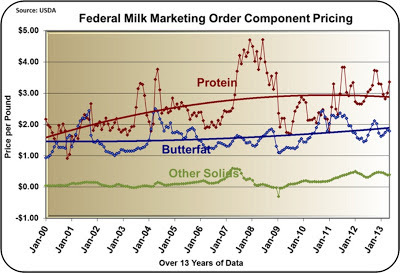 The price of Other Solids is based on the price of dry whey. The breakdown of the milk payment pie chart shows that 54% of the milk check is now attributable to milk protein payment. 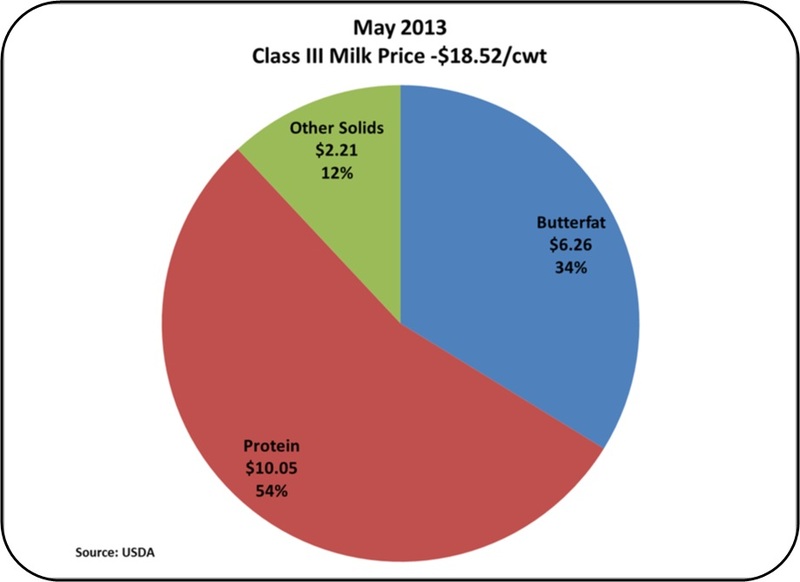 Butterfat's contribution declined to 34% of the milk payment. Inventory levels are a concern. 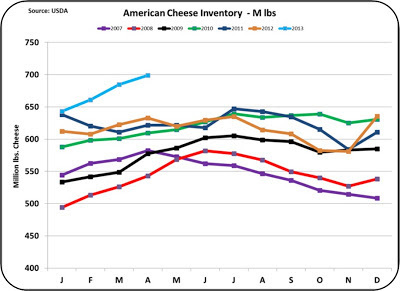 All the commodities that influence milk pricing, cheese, butter, and dry whey, are showing high inventory levels. Inventory reporting lags by about one month. 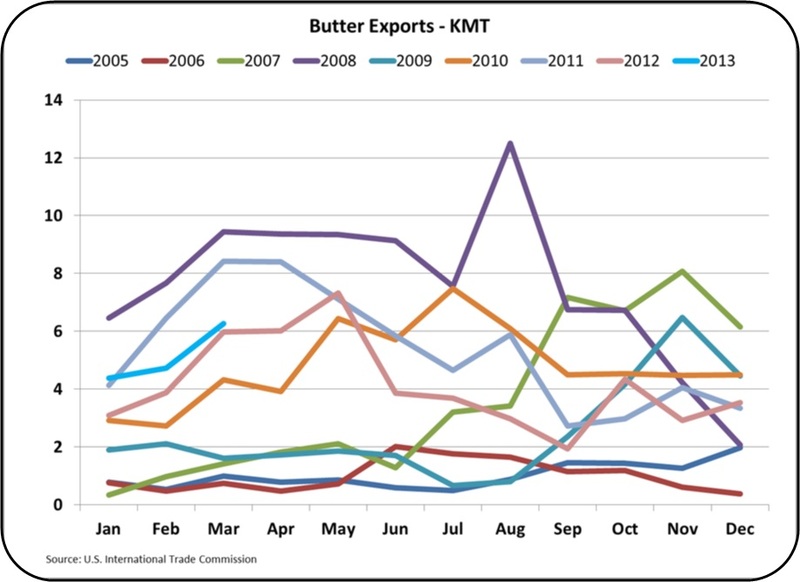 As of the end of April, cheese and butter were at higher than historic levels and showed an increase over the prior month. 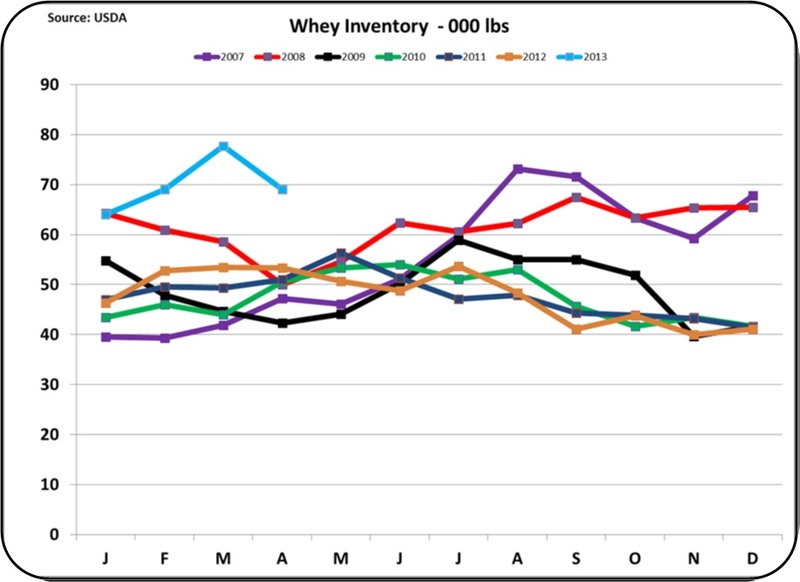 Whey inventories did take a sizable decline from the prior month, but were still high compared with prior year inventory levels. 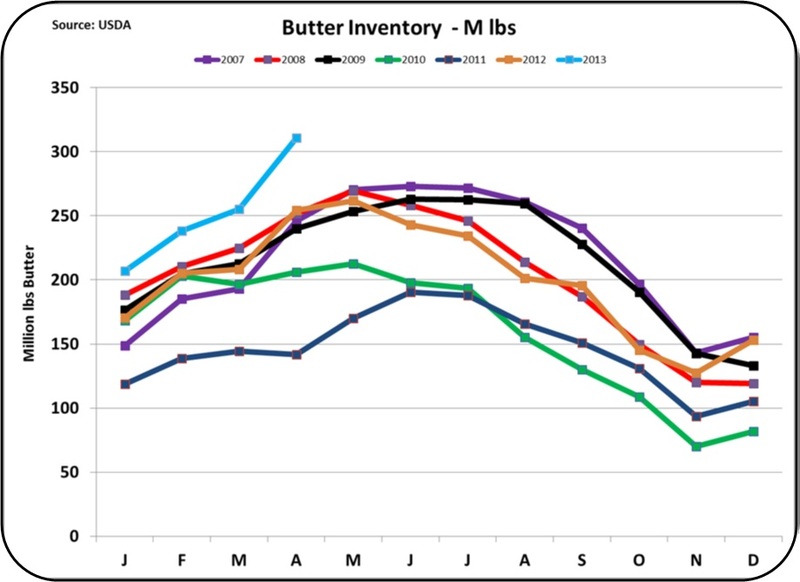 High inventories typically result in lower prices, as supply is greater than demand. While inventories typically increase prior to the summer months, the current high levels could be setting up a price decline in the coming months. Exports are near normal levels, but they are not setting new higher records. 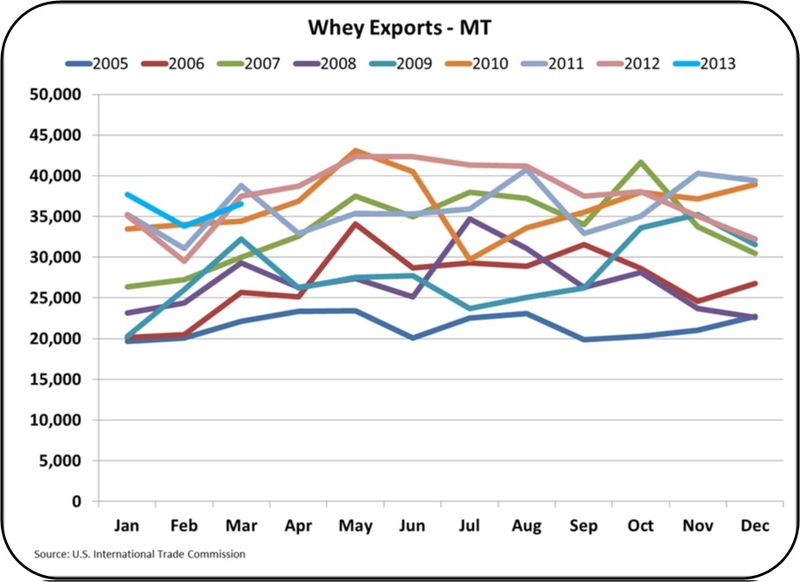 Cheese, butter and whey exports are all running at last year's levels with no meaningful increases. 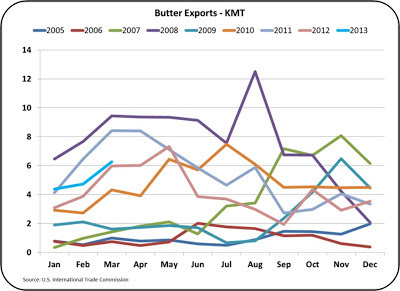 The export markets for cheese and butter are much smaller than domestic consumption, but they are, by far, the most volatile factor in product disappearance. 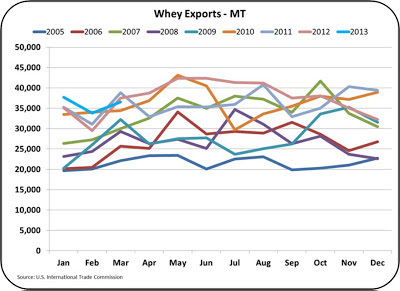 Nearly half of dry whey is exported, so export volumes are extremely important for dry whey disappearance. As will be discussed below, exchange rates are favorable for exports, so there is good reason to expect improvement. 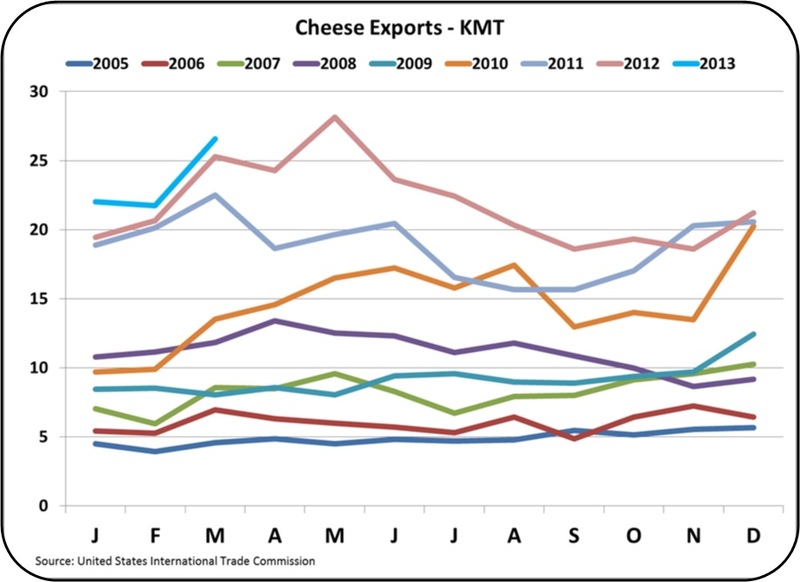 The three major exporters of dairy products are New Zealand, the EU-27, and the U.S. Comparatively, the exchange rates are favorable for U.S. exports. 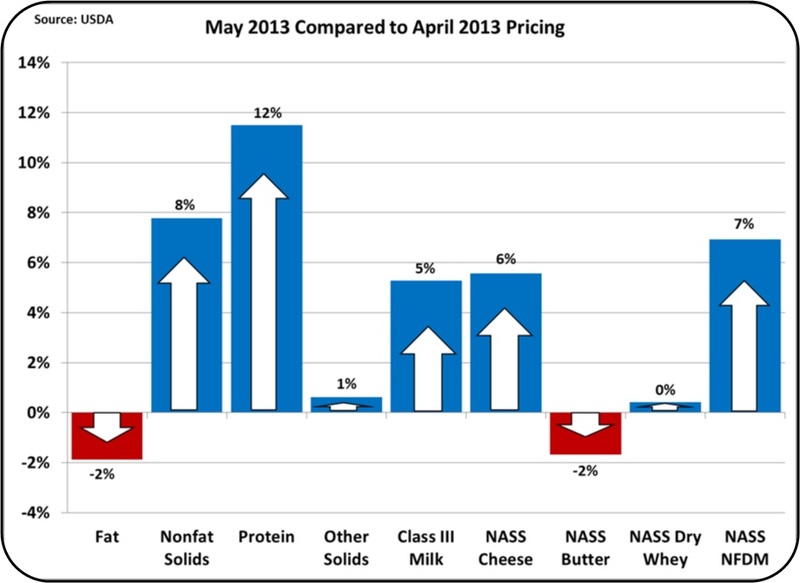 A weak USD makes U.S. dairy products less expensive on the global market. 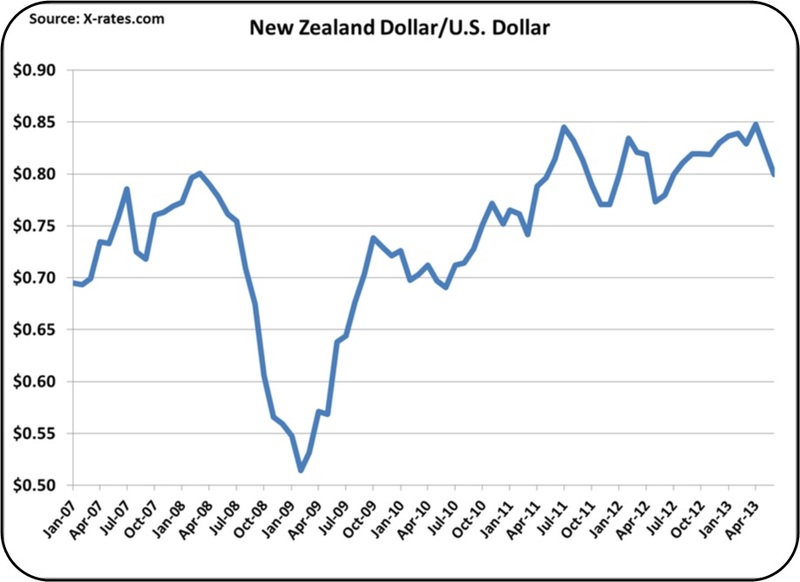 The charts below compare the USD to the New Zealand Dollar and the Euro. 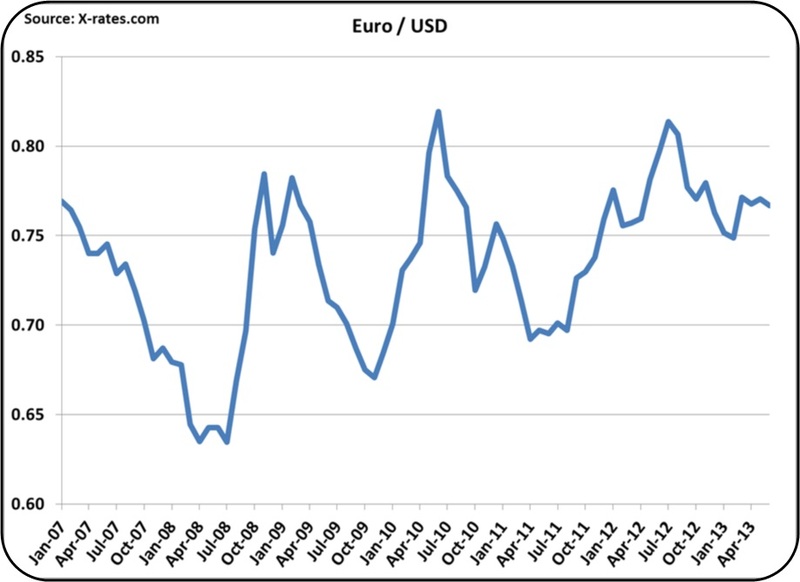 A higher line indicates a stronger currency vs. the USD. New Zealand's Dollar is stable and significantly higher than the 2009 period when U.S. exports tumbled. 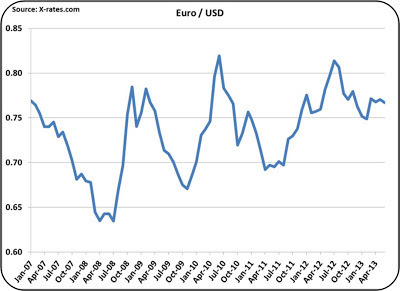 The Euro, second chart below, is also stable vs. the USD and at a rate that is favorable for U.S. exports. 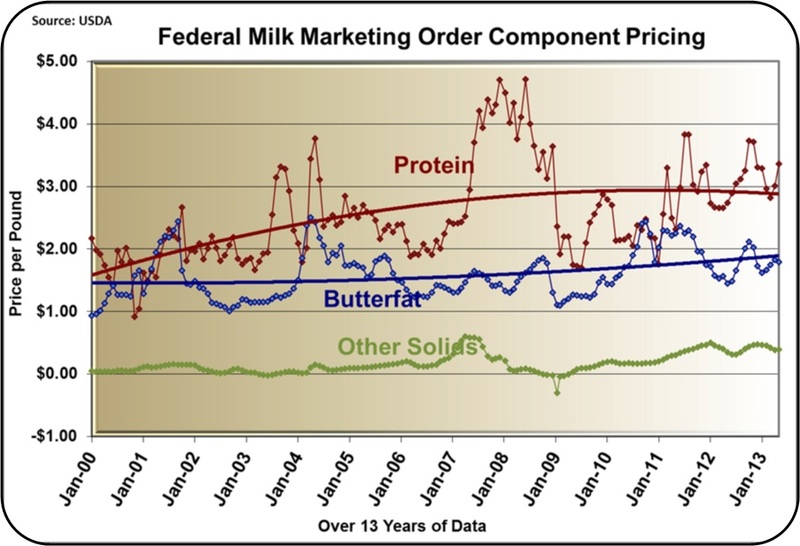 Milk prices are good, and factors like exchange rates are also favorable. 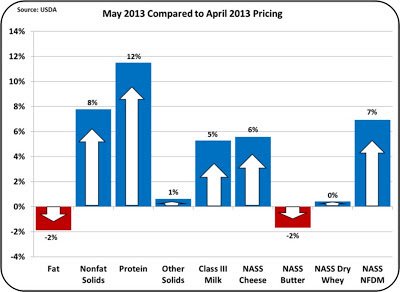 Futures prices for Class III milk are in the $18 range for the rest of 2013. There is no good reason for any downward pressure except for the high inventories. Increasingly important is the impact of protein on milk payment. Protein currently makes up 54% of the check and there is good reason to expect this to increase further.